Skills and Ideas Taught: SGD is teaching the skills through concept reinforcement, tactical (cognitive) reasoning and decision making to better improve the chances of surviving and winning in a real-world war-at- sea encounter between the US Navy and adversaries. Learn, adapt, and prevail in constantly changing and degraded conditions. -Are we manning the equipment, or equipping the man? -The true measure of a systems’ capability is not merely how capable it is, but how capably it is employed. -Naval systems are not usually underemployed because an operators doesn’t know how to use it; rather, they commonly don’t know why to use it. Goal or Challenge: The in-simulation goal is simply to avoid being hit by missiles. But the goal of the project is to educate students about the existence of EW systems and tools as a viable option in real-life threat situations. In-simulation we are teaching students that different missiles select targets via different criteria – and they learn which subset of their decoys / softkill solutions are effective at masking each criteria. When students learn this skill well, they are hit by fewer missiles. But the real success of the project comes from the reinforcement of EW Softkill as an optimal solution to anti-ship missiles. So simply reinforcing this process of thinking of missile selection systems, and their interactions with various decoys, is the primary “idea” we are teaching – even though it’s not ever the student’s focus. Assessment Approach: SGD has a robust analytics engine which tracks user performance over time, and compares that data with cohort data. The obvious measurement is simply game score – but in many ways our best measure of success is simply time. Our goal is not to train students on the specifics of EW softkill systems – but rather to get them thinking about how & when to best use those systems. So any interaction with the product – anything we can do to keep them within our system longer – serves to meet our goals. This is why the social backbone is such a key part of the experience – because social connections help keep players invested. 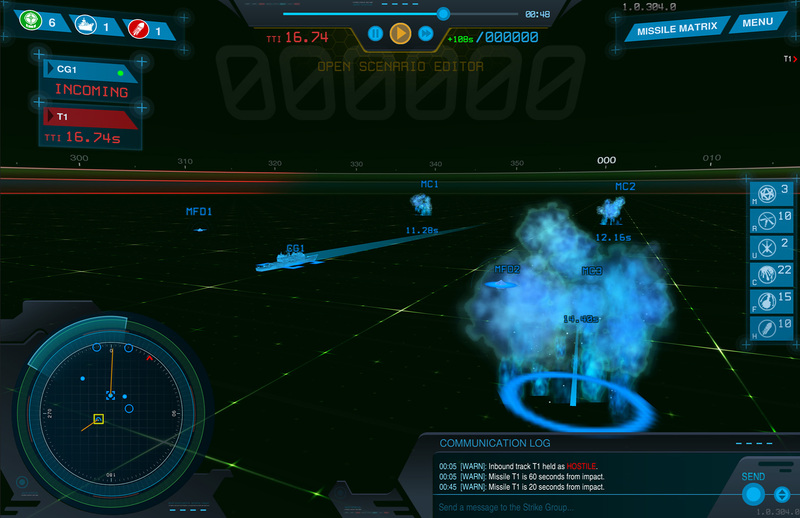 Description: Strike Group Defender: The Missile Matrix is the US Navy’s first prototype multiple player, game-based software-training program that trains, tests and evaluates navy personnel employment and use of Navy Electronic Warfare tactics and systems in highly contested, increasingly difficult wartime situations. It employs state of the art technology and methodology from the video gaming and social media industry to provide an architecture and learning ecosystem that harnesses the power of crowdsourcing, cloud deployment, analytics, and behavioral modeling while maintaining the allure of modern media that is focused on young personnel.